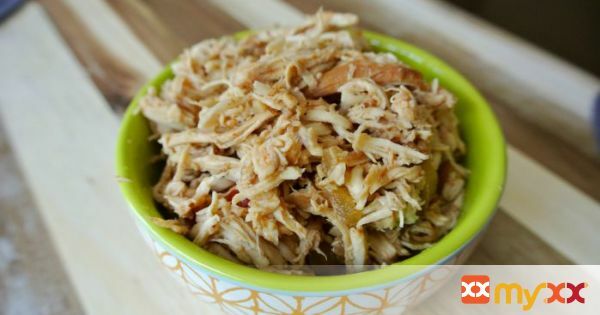 Let the slow cooker do the work and enjoy this shredded chicken on a whole wheat bun, on a salad, or with mashed potato and corn on the cob. 1. Stir tomato sauce, chiles, vinegar, honey, paprika, tomato paste, Worcestershire sauce, mustard, ground chipotle and salt in a 6-quart slow cooker until smooth. Add chicken, onion and garlic; stir to combine. 2. Put the lid on and cook on low until the chicken can be pulled apart, about 5 hours. 3. Transfer the chicken to a cutting board and shred with a fork. Return the chicken to the sauce, stir well and serve. 4. Make Ahead Tip: Cover and refrigerate for up to 3 days or freeze for up to 1 month. 5. For easy cleanup, try a slow-cooker liner. These heat-resistant, disposable liners fit neatly inside the insert and help prevent food from sticking to the bottom and sides of your slow cooker.